This story was one of adventure, bravery, survival and courage. 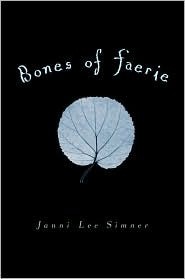 Bones of Faerie was original and unique, and brought something to the table that not many faerie stories do. It was very interesting how nature itself is what threatened humanity. If one walked into the forests, there was a good possibility that one would never walk back out. But Liza braved it anyway, which is why I loved her. She suffered so much loss and abuse, but she didn’t allow that to get in her way. She was determined and caring, as well as very unselfish. The plot was great, although it lagged in some parts. But the lags could be very easily overlooked. The writing also at times grated on my nerves due to the repetition, but the descriptions of the scenery were wonderful. I definitely recommend this novel for any fans of faerie novels, and even non-fans. Also, I love the simplicity of the cover. It conveys a certain… peacefulness. I give this novel 4 out of 5 stars.